Labor day weekend is over and that means no more wearing white, closing of summer, yada yada yada. I don’t believe in any of that. I’m still sporting around my watermelon purse and melting in the 90 degree heat with no AC in New Haven. So yeah, you got some time to go out and enjoy the rays of summer. My first thought when traveling or going somewhere new is, “What kinds of gluten free treats can I get?”. My stomach is king. Being a Celiac for the last 15 years has me programmed to seek out and find the yummiest new bakeries have to offer. And with summer starting to fade (It’s not GONE!! ), I’m grabbing all the lighter, fluffier, colder desserts I can shove in my mouth. I have had buckwheat crepes before and kind of put the whole idea behind me. Gluten free crepes just didn’t work. For me, at least. I like the idea of thin, almost flakey crepes because almost nothing gluten free has that kind of texture. Get down and start worshipping this little shop. They specialize in rice crepes and that apparently makes all the difference. They have both savory and sweet, but since we are talking summer treats, I got the chocolate nut party. Yeah, I went big. I honestly just could have had the ice cream and crepe and skipped the rest. The chocolate and nuts were bonus but the real love was this thin, almost croissant like crepe wrapping up cold, yummy ice cream. I haven’t tasted anything like it and can say this is hands down my favorite gluten free treat in NYC right now. This place was a few blocks from the Air BnB I stayed at in LA. The real draw is the large amount of flavors of gluten free fonuts and also the fact that they aren’t fried. Hence, the fonut name. Not going to lie, I tried almost all the flavors in the few days we were in LA. If it has a fruit name or sounds super sweet, it probably is. I recoiled and couldn’t even eat the raspberry or blueberry ones. The glaze was killing me teeth with the amount of sugar. I almost didn’t go back. But I tried the chocolate hazelnut and HELLLOOOO! It was light, exactly what I want during the summer, and tasted just like a donut (according to my wife). It wasn’t like a heavy, cement brick that many gluten free donuts can be. Regular gluten free donuts you can feel sitting there in your stomach and just, ugh, it feels gross. 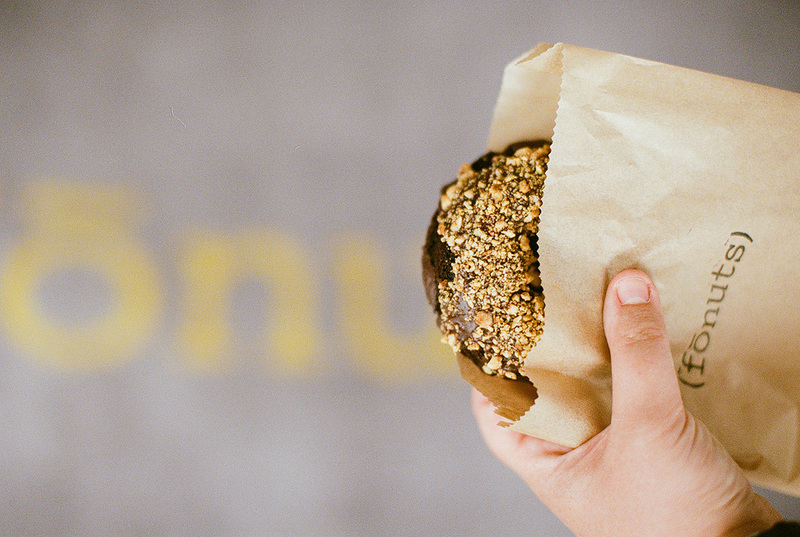 The non-fruity fonuts make a perfect treat to end a date. Their shop is super cute and worth grabbing the one table they have outdoors.